They're abandoning the United States and flocking to Europe and Japan in search of better places for their money to grow. The bull market has been underway for over six years in U.S. stocks, but there are concerns that it's overdue for a correction. "The fact they are pulling money out of U.S. equities seems to indicate some sort of fear about the future," says Alina Lamy, a senior analyst at Morningstar. The "Great Rotation" out of U.S. stocks began about a year ago, but it has really picked up steam in 2015. 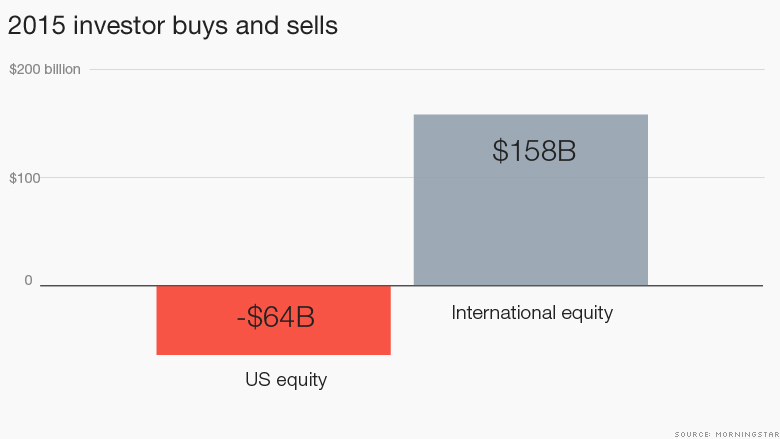 So far this year, investors have withdrawn $64 billion from U.S. funds and put $158 billion of new money into international stock funds, according to Morningstar. One reason investors are sprinting overseas is because American stocks have been essentially flat this year while European and Japanese stocks are scoring double-digit gains. Japan's Nikkei has surged almost 19%, and Germany's DAX has shot up 17%. Related: America's Act II: Will the economy come back? Bet against the Fed: "Money is flowing away from the U.S. where the central bank is becoming less accommodative and toward where the central bank is becoming more accommodative at the moment," says Mike McGlone, director of research at ETF Securities in New York. The U.S. economy is growing in a good (but not great) way. It's enough for the Federal Reserve to likely raise interest rates in September. Even after a rate hike, the U.S. is still expected to grow, but the prospects of big growth in corporate profits have dimmed. Elsewhere, central banks are pumping money into their economies in an effort to get growth going. When the U.S. did the same thing after the Great Recession, it caused huge gains for stocks. Investors now expect a similar bump for Europe and Japan. Where to go: Japan and Europe look especially good because their economies rely heavily on exports. The value of the yen and the euro have fallen sharply against the U.S. dollar in the past year. That trend is likely to continue if the Fed does raise interest rates. The result should be an export boom for Japan and Europe as their products look even cheaper. "We think Japan still has a lot of potential," says Brian Leung, investment strategist at Bank of America Merrill Lynch. "It's still not looking too rich relative to historical measures." Notice that no one is talking about money going into emerging markets. They have taken a beating this year and that's likely to continue, says Leung. What's different now: The "Great Rotation" is not entirely new, says Shelly Antoniewicz, senior economist at Investment Company Institute, although investors haven't yanked this much money out of the U.S. since 2012. But what's truly different this year is that the cash exodus has spilled into an American asset that's been booming for years: the ETF. The most popular ETF in America (the SPY fund (SPY) that tracks the S&P 500) has lost $42 billion so far this year -- already more than it has lost in any prior year, says McGlone of ETF Securities. While investors seem to be making a sound bet based on macroeconomics, they don't have a great record on market timing historically. "It's happened many times in the past that investors pull money out of that asset class only to see stocks improve afterwards," warns Lamy of Morningstar. 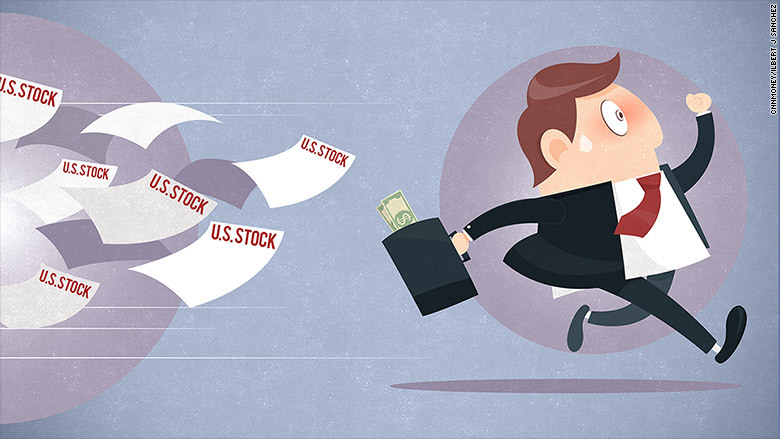 For long-term investors, the key is to stay invested, even in rocky moments.